The show continues until July 28th at the gallery, located in a nondescript industrial area at 4400 Fernlee Ave., far off the bustle of downtown RO’s restaurant and bar district. 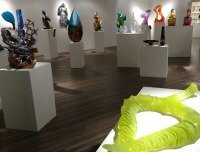 Once inside, however, even someone not normally enamoured of glass art might be wowed by the multitude of shapes, colors, sizes and materials in several rooms, against black walls and appropriately on view to the sound of soothing, introspective New Age music. There is everything here form abstract large crystal-like figures mounted atop one another, to an enormous white intricate cage of repeating spirals, to dollhouse diaramas (by Emily Brock), to emotion-laded figures jutting from walls splintered in angst or ecstasy (by Mari Meszaros). The glass objects can also be found in minature – from brooches to pendants and necklaces. There’s even delicate stringy glass bead masks. There is glass sculpture that looks like Inuit animal sculpture (by Shelley Muzylowski Allen) and another that is a pile of giant multicolored crystals (by Richard Royal). If you like marbles you might like large versions of them or cubes with intricate marble-like spheres and spirals inside (by Wilfried Grootens). There is delicate sculpted glass of mythological creatures, there are abstracts of seemingly every size, shape, color or texture, often clashing on the same piece. And there are the prices. Yes, this art is for sale, and, honey, it ain’t cheap. But you might expect that for an exhibition of this calibre. Prices in the $20,000's or $40,000's are common. The object we found priciest was a bone-like bird skeleton by US artist William Morris - $265,000. Meanwhile, Italy’s Davide Salvadore’s blown and carved set of totem like elongated birds, as well as his recreated exotic musical instruments, are awe-inspiring and remarkable for their exactness and colour. Galley Co-owner Corey Hampson says demand by world artists to enter this show is great. The show’s name is NEXT, and gallery owners asked artists to offer works that would predict the future. One is a table full of broken and discarded turquoise glass and bottles, seemingly left askew as if as trash. That’s one artist’s answer, anyway.